What’s the easiest way to brightens someone’s day? By sharing your smile! Easy as that! Don’t you just love when some one shares there’s with you . . . I know I do. That little smile, which we all have, can bring so much joy to others. Ok, it might be a little added bonus if decide to add some bright summer stripes and florals as well, but it’s certainly not necessary. right? I could go on and on but really it would take away from the simply little message of sharing a Sunday Smile. As always my friends, thanks so much for dropping by, now go share that smile of yours. You are SO RIGHT, Trina!! And this outfit, which I love, certainly would bring out smiles wherever you go. So true. A smile goes a long way. 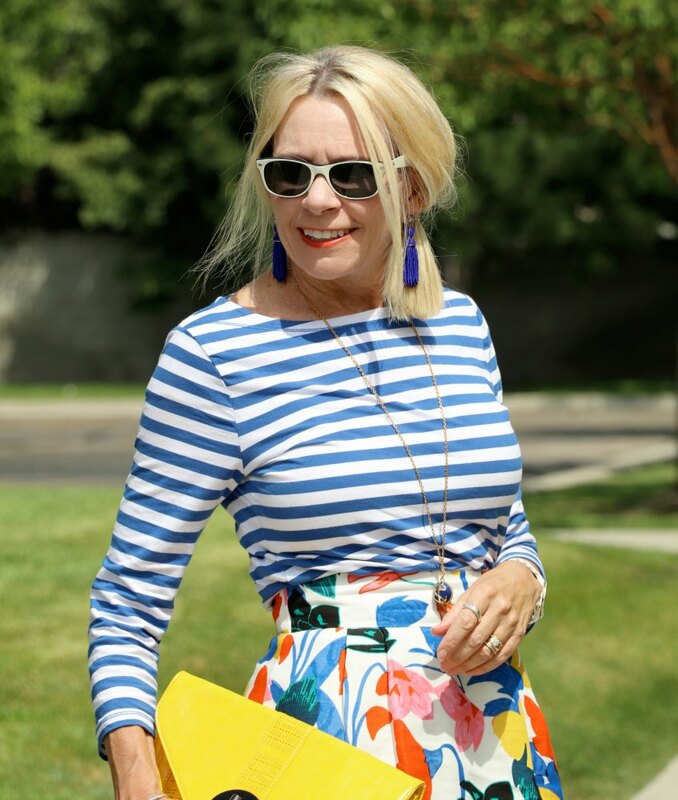 Love this bright and cheery outfit! I smile and laugh a lot, as you know. So I know it is true what you say. And giving compliments out loud instead of just thinking them, is also a nice way to brighten someone’s day (and your own). Ever so nice outfit. You could stick everything in the post and send it to me. Although I might find out I don’t look as good in it as you do. So on second thoughts…. keep it haha. I smile almost all the time and compliment others often. It really does brighten them. I love your bright outfit. It has given me ideas. I have never worn stripes and print together but I really like it.